The Yenisei river flows south to north through the whole of the Krasnoyarsk region. Its natural beauty has been admired by travelers. RIR presents you amazing photos of the river in winter. 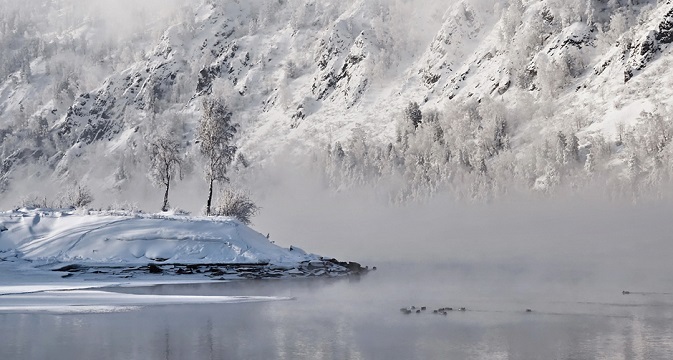 Taken during first snowfall on the Yenisei river near Krasnoyarsk. Taken in heavy frost on the Yenisei, from an observation point in the region of Ovsyanka. Usually in such cold the river gives off so much steam that it blankets the opposite shore. Here a gust of wind carved a fleeting window in the mist, only to be enveloped once more in white silence. Taken in frosty conditions on the banks of the Yenisei near Krasnoyarsk. The river was steaming so much that patience was required while waiting for the rime-coated trees to appear through the mist. Taken during the first snow in a small village surrounded by dense forest not far from the Yenisei. A strange figure entered the frame as if on cue. Taken during snowfall on the Yenisei. Only the crunch of snow all around, the river and the dense forest. Taken on the banks of the Yenisei in bitter cold. The trees here are resplendent in any weather. Taken on the banks of the Yenisei in the region of Divnogorsk. In extreme cold. Taken on the Yenisei. The water and humidity had caused such hoarfrost to form after several days of cold. Taken in frost on the Yenisei near a pier. A winter abode for barges and ships. Taken on the Yenisei near the island of Tatyshev in -35°C cold. Taken at the Krasnoyarsk reservoir after the very first snowfall. It had been snowing all day, fresh and fluffy. All photos are taken by Marina Fomina.